What do the 1970s mean to you? If you’re old enough, you might remember glam rock, punk or ska; Star Wars and Quadrophenia; the VW Beatle, football casual away days; or how about the first Sony Walkman, lava lamps, or the Concorde? Above all, when asked to reminisce about the seventies, many of our customers talk fondly about the unique and pioneering fashion that characterised the decade. Gabicci understand this nostalgia as well as any menswear brand – that’s why so many of their garments boast impeccable 1970s retro credentials. The definitive Gabicci look incorporates Italian inspired styling with an air of authority and class, brought to the UK by Gabicci founders Jack Sofier and Alex Pyser after a brief vacation in the Italian seaside town of Gabicce Mare. Since 1973, Gabicci has played a huge part in music and youth culture, proudly worn by the likes of the Specials and Bob Marley, to name but a few. Grab an exclusive 10% discount with Apache’s fantastic offer code “GABICCI1”. 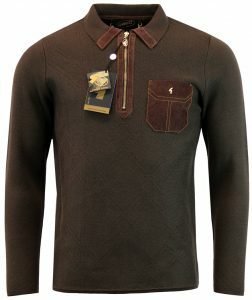 Part of a special #AW16 Limited Collection celebrating 35 years of Gabicci, this Half Zip Cardigan in Coffee epitomises the superb retro designs that Gabicci have long specialised in. The garment features a clever use of suedette on the pocket patch and the one-inch collar piping, as well as an eye-catching tonal gold zip and matching gold Gabicci “G” badge. 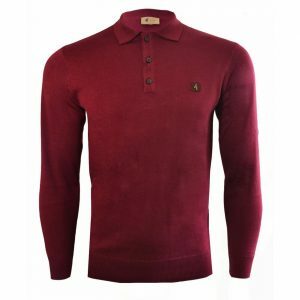 An all-year round classic, the garment is cotton rich and finished off with a hanging golden chain in the collar. 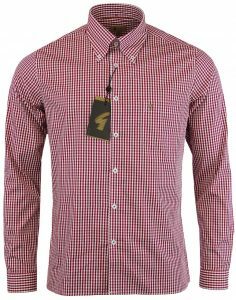 This “longer” rolled button-down shirt is made from 100% cotton poplin, and its sharp Gingham pattern looks equally stunning up close or at a distance. The rolled collar features prominently, and the flattering semi-slim fit has been a hit with many of our customers. Gingham fabric is an eternal classic that will surely be around in decades to come. You can also wear it in Thames Blue. Gabicci also excel with outerwear – check out their unique take on the classic fishtail Parka, putting a signature “retro” spin on a much-loved garment. 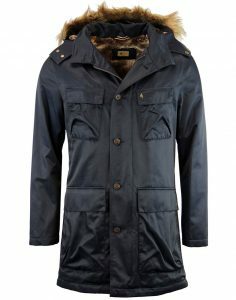 The coat boats a luxurious faux-fur lining and a detachable hood, and is lightweight enough to allow for layering whilst offering solid protection from the elements with its high-quality tonic fabric. On special offer right now at £120. Another all-year-round favourite, this simple, elegant fully fashioned Knitted Polo in the colour Port makes the perfect first layer for your winter outfit. The super-sort, cotton-rich knit has a beautiful handle that makes this fabric a joy to wear, and will leave you feeling snug and stylish in equal measure. A small tab keeps the collar nicely in shape, and the three button placket is as good as on any polo shirt. The garment is also available in Navy. Tempted? Grab an exclusive 10% discount with Apache’s fantastic offer code “GABICCI1”, or visit our Horsham shop. PreviousHalf Price Madness In Our January Sale! !